Leading in with a strong “why bother” entry? I like your style, Robot Workshop station. In the several years that I’ve played Fallout I have never even once considered using a baton as a weapon. Even a duel-wielding robot, as cool as that sounds, will not redeem that lousy thing. Oooh, great idea, a protective robot that has all the firepower of a novelty handbuzzer. That’ll show ‘em! The stun mod is okay if you’re bored, low on materials and skills, and want to play around making robots, but in general, it’s a novelty at best. These all fall under a mod class I like to call “you’re wasting everybody’s time”. After Fallout 3, New Vegas and Fallout 4, I’m a little tired of the Robobrain and Protectron weaponry. These fall low on my list because they are boring and repetitious, but you might find some use for them. The creation of these mods through the re-use of unrelated assets is pretty impressive. For that, and the fact that I can make a robot with THE CLAMPS, I want to like them. The Skull Mace is particularly badass looking. However they, and all the other melee mods, are almost useless in battle, rendering them another mere novelty. WOMP WOMP. The Sniper Laser mod is a decent idea but the thing about robots is that they don’t do stealth. Something about the CLANK CLANK CLANK of their lumbering metal bodies tends to tip off enemies in advance. Case in point: above is a picture of a robot with double Sniper Laser hands up against a Deathclaw. He died shortly after this picture was taken. In theory, the stealth arm blade turns your robot into a shadowy assassin. In practice, it’s about as effective as using a ceiling fan blade for a knife. File this one away in the “Why Bother?” box with the others. I’m not sure how I feel about this one. It has yet to prove its usefulness to me, but still looks really cool when fired. My tests with hordes of ghouls and Deathclaws tells me it pairs well with a Gatling Laser. Depending on the enemies you’re fighting, the Gamma Gun can either tear through them like tissue paper, or...do absolutely nothing at all. Don’t take your chances, skip this arm attachment. This classic Fallout melee weapon is an effective killing machine, but not necessarily the best option in a close combat situation. If intimidation factored into combat mechanics I’d say go for it but since that’s not the case, stick to long range or missile based weaponry. It’s easy to miss this one in the Robot Workshop but don’t underestimate it: in combination with a rapid-fire arm attachment, like the Minigun, it can cut a devastating tear through an oncoming horde. Like the Shishkebab, the Heavy Flamer Gun may not be the best in a tight combat situation or a closed room, but in an open field, let that baby rip. Balance it out by pairing it with a Gatling Laser or a Minigun. If you’re gonna do lasers, this is the way to go. Alternately, you could also use the Unstable Laser Gatling, however in exchange for increased damage it may suddenly break on you, a chance you may not be willing to take. In general Miniguns are always a great bet, especially if you’re not the one having to lug them around. They tear through a crowd easily, provided your targets are of the soft skin variety, and pump enough rapid fire bullets that you can easily keep back waves of Ghouls. Also available is the Explosive Minigun, although like the Unstable Gatling Laser this one holds a lesser spot on the list despite its increased firepower, due to the possibility it may spontaneously break. While I recommend that most of the time you give your robot two different attachments complimenting each other’s strengths and supplementing their weaknesses, you should definitely go double with Missile Launcher hands. According to my “research”, a single Automatron with no body armor can take on a Deathclaw 1 on 1 and kill it within seconds. By far this is the best arm you could possibly weld onto a robot body. The first Fallout 4 DLC, Automatron, is a new robot-heavy chapter in the game that allows the player to build robot drones to act as companions or settlement workers. This is done through the new Robot Workshop, where robots can be built from scrap or salvaged for components and given bizarre and powerful modifications, most notably the weaponized arm attachments. Curious about their range and effectiveness, I set out to make a robot with each attachment and test its mettle in combat, using console commands to unleash waves of enemies. 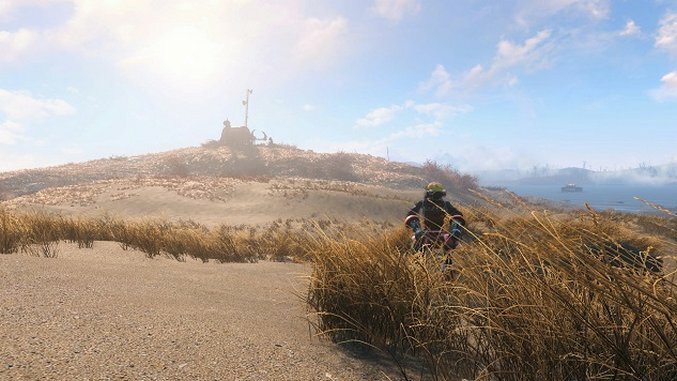 During the events of the DLC, when it comes time to place the Robot Workshop and start building an Automatron army, the game directs you to Spectacle Island, giving your drones a wide open space in which to roam. Since this area also requires the sprawling protection only they can provide, it is an ideal space to try out the many arm modifications available. There are 31 different arm attachments for the Automatrons made at the Robot Workshop station, and in terms of overall value they range from “worthless” to “cool but pointless” to “I could blast the face off a Deathclaw with this thing.” With a few keystrokes I unleashed Deathclaws, Ghouls and Raiders on a robot army comprised of 20 different arm attachment customizations, and after observing how they fared, factored this into a list gauging the value of each. Perhaps predictably, the melee type mods offer the least amount of protection and combat effectiveness, quickly succumbing to physical damage. The performance of the rest varied depending on which type of enemy was spawned, but universally the robots modified with double Missile Launchers worked the best. When making your robot, try to pair its attachments such that they complement almost any combat situation, taking into account both armored and unarmored enemies. Here are all the attachments available, listed in order of worst to best.